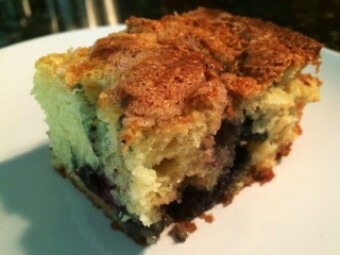 1/4 cup Blueberries, fresh or frozen, tossed with a tablespoon of all purpose flour. In a large mixing bowl, sift flour with baking powder, baking soda, salt and about 1 cup of sugar. In a separate bowl, beat together the eggs, sour cream and vanilla. Add egg mixture to flour mixture and beat until just combined. Grease a 9-inch square dark metal cake pan. Spread the batter in the pan. Add blueberries, scatter them over the batter and stir a little bit so that they stay in the top layer. In a small bowl, mix about 5 T sugar with the butter and cinnamon with a sturdy fork, until they are blended and resemble cornmeal (i.e., you should have a mixture of fine crumbs, not a smooth mixture). Sprinkle topping over batter. Bake for 35 - 40 minutes, until a clean toothpick inserted in the center of the cake comes out dry. ** You can easily substitute low-fat sour cream here with no loss of texture or taste.